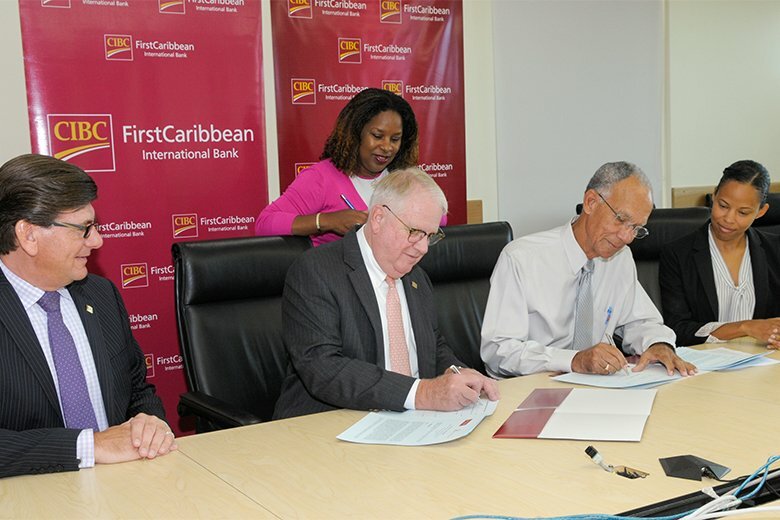 HCC Signs MOU to Advance Workplace Wellness Programmes in the Caribbean, on Wednesday April 12th, 2017, the HCC signed an MOU with FirstCaribbean International ComTrust Foundation to improve and contribute to chronic diseases prevention and control in the Caribbean. fostering of a greater level of community volunteerism, in the response to NCDs. 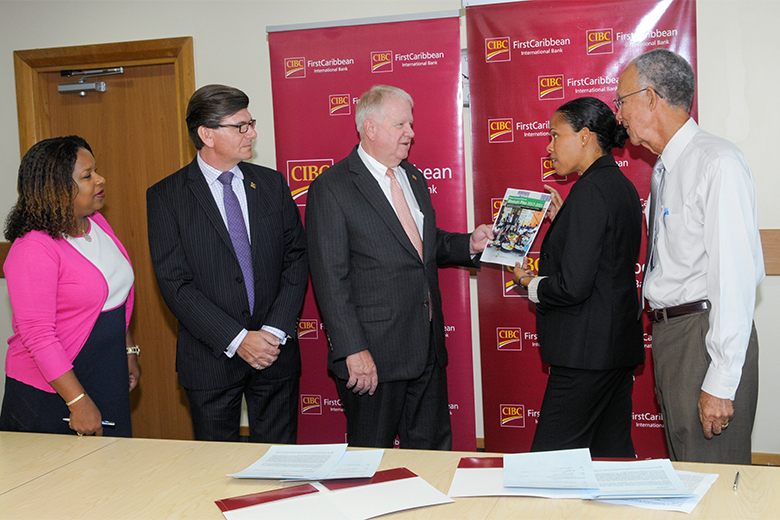 Present at the signing were: Gary Brown, CEO of CIBC FirstCaribbean and Chairman of FirstCaribbean International ComTrust Foundation; Debra King, CIBC/FCIB Director, Corporate Communications and Neil Brennan CIBC/FCIB Managing Director Human Resources. HCC was represented by President Sir Trevor Hassell and Executive Director, Maisha Hutton. Two years ago the HCC held a meeting of Caribbean private sector businesses to assess their response to NCDs. At that meeting it was recognised that the private business sector in the region contributed in several ways to NCD prevention, but that the contribution of that sector could be improved with greater collaboration with civil society, with the power of business leveraged for advocacy on major public health issues, philanthropy, empowerment of communities and special groups, development of specific revenue streams and mobilization of core competencies. The relationship that was initiated this week between the HCC and CIBC/FirstCaribbean reflects the outcomes of the meeting and are in keeping with the strategic pillars of accountability, advocacy, capacity development, communication and sustainability, of the HCC Strategic Plan, 2017-2021. This 3 year collaboration is a very important one for the HCC. looked forward to a highly fruitful collaboration as the HCC and CIBC/First Caribbean seek to make a truly meaningful contribution to the prevention and control of chronic diseases through lifestyle enhancement of people of the Caribbean, and it is my personal aspiration that this relationship will serve as an international best practice model of how the private sector and civil society can work together to support the public sector in the “whole of society” approach to NCD prevention and control. We are extremely pleased to be embarking on this venture with HCC, and look forward to our partnership being a model for others in the private sector to follow. Non-communicable diseases are a serious concern for our societies across the region and a sure way to start winning the battle is through knowledge and education. Workplace wellness is a particular focus for our company. Our people spend a significant portion of their time at work, so it is in the interest of both the company and our employees to ensure the environment is conducive to a productive and healthy work culture. Healthy employees are happier and will deliver great service to our clients. This MOU goes further, as we hope to be able to share the knowledge we gain with our clients as well. So it’s a win-win for all – healthier employees serving healthier clients, leading to a healthier society as a whole.